I’ve managed to shed light on some of the mysteries of sushi in the past two instalments of this series (here and here), but a few questions still remain. Why is it that non-Japanese people, who until recently balked at the thought of raw fish, have now started eating sushi? As a Japanese person, this somehow feels rewarding, embarrassing and frustrating, all at the same time. Nobody seems to remember that sushi was once branded a disgrace: a suspect, ‘fishy’ food – the slander of the past appears to have been completely vanquished. Us Japanese were once discriminated against – racially – as ‘weirdos who eat raw fish’, so I can’t help but feeling a little anger at the unremorseful foreigners who now tell me ‘sushi is great’. This ‘historical awareness’, however, does not seem to be shared by the younger generation, so me losing my temper won’t make any difference anyway. After all, my anger flows from a major misunderstanding: what people all around the world eat these days isn’t really sushi (鮓）– it is ’sushi’. Now you might be confused – isn’t sushi just sushi? Well, sure, sushi is sushi, but the original Japanese term and what people mean by ‘sushi’ nowadays do not always refer to the same thing. After all, the ‘naporitan’ spaghetti you get at a traditional kissaten is certainly not a Neapolitan dish, it’s pure washoku. You might already realise what I’m getting at here, but let me explain further. Just like living beings, culture undergoes evolution. It’s a cliche to start an evolutionary story at a specific moment in time, but bear with me here: 40 or 50 years ago, a new ‘species’ of sushi, topped with avocado and mayonnaise, was born in California. 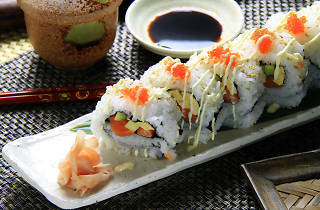 Later referred to as the California Roll, this innovative creation appealed to Westerners’ general fascination with new things and came to be associated with concepts such as ’healthy’ and ‘diet’, catalysing the geographically widespread evolution of a new category of food – rice topped with a slice of fish. A movement calling for sushi to return to its original Japanese form did emerge, but evolution is rarely amenable to regression. Instead, types of ‘sushi’ that had little or nothing in common with the original came into being, as I personally found out at a Japanese restaurant in the Nordics around the year 1990, being ‘treated’ to some truly terrible ‘sushi’ when celebrating my son’s birthday. Such mistakes were of course eventually weeded out, and while steadily moving away from the original, a number of new sushi ‘species’ and tastes were born, giving birth to the ‘sushi’ of today. This new group of species known as ‘sushi’ has subcategories – ‘maki’ and ‘nigiri’ – and is steadily expanding. The original Japanese strain of sushi lives on, but it has now become part of a larger whole. This is what I mean when arguing that 鮓 is ‘sushi’, but not all ‘sushi’ is 鮓. One should also note that even the original is undergoing change – call it degeneration or evolution – with stray subspecies like ‘natto temaki’, upsetting the intentions of self-proclaimed purveyors of ’Edomae’ sushi, who pretend to offer the most original kind. From an evolutionary perspective, such claims hardly merit much attention, and are more matters of taste than anything else. Sushi’s culinary evolution has precedents: take sandwiches, tacos and hamburgers. If we accept the definition of a sandwich as meat, vegetables and other fillings placed between two slices of bread, it allows for a huge variety of ‘species’, distinguished by different types of bread, ingredients, shapes and sizes, from super-thin creations to monsters so thick you can barely bite into them, with this variety constantly growing larger. Any allegiance to the Earl of Sandwich, the presumed originator of the word, has long since vanished. Indeed, the word ‘sandwich’ can now be used even for non-culinary purposes – it aptly describes a certain pro wrestling move. This makes me wonder if we’ll eventually start using 'sushing' in reference to the way football players jump all over each other to celebrate a goal (well, maybe not…). As for the above-mentioned tacos and burgers, all I need to say is there are tacos made with gyoza skin instead of tortillas, and you’ll see my point. Although the above surely clears up some misconceptions, my anger still smoulders on. Why is it that while knowing ‘sushi’ in New York won’t be the same as 鮓 in Japan, I still feel upset when confronted with the concept? My discomfort flows from a larger problem, namely the closed-off nature of Japanese culture and cultural identity. Let me explain. It’s common knowledge that football first developed in England, from where it spread around the entire globe. England, however, hasn’t been able to win the World Cup for quite some time. Adding insult to injury, some pundits even claim the heart and soul of football is best expressed by South Americans or – worse – by recent champions Spain. I presume the English feel their cultural identity is being violated by such claims, and the debate on why the Three Lions aren’t winning obviously rages on unabated. Yet, at the same time, I suspect the English can ease their minds by reminding themselves of their evolutionary position in this case – being ‘original’ allows for a certain sense of superiority. Returning to sushi, what I wasn’t able to do in New York was to act like the self-righteous English football fan. If only I had managed to do so, I could have gone without losing my temper at the sight of the Big Apple’s ‘rice topped with a slice of fish’. I should instead have rejoiced at the wonders of evolution, applauded how far Japan’s very own sushi had come. Perhaps the reason I fell short has something to do with the so-called isolation of culture on the Japanese archipelago. Japan lacks the long history of interaction with the outside world that gives the English, also inhabitants of an island nation, an advantage in dealing with mutated forms of sandwiches and football. Japanese culture has obviously spread to foreign lands before as well, but it always did so under labels like ‘exotic’ and ‘strange’. Sushi may have started out the same way, but eventually evolved into something different, just like 柔道 become ‘judo’, an Olympic sport. In the future, as they become globally accepted, more aspects of Japanese culture may undergo similar changes. When this happens, Japanese people should consider it an honour, rather than clinging to a narrow form of cultural identity and arguing that ‘this isn’t sushi’ or ‘ippon is the right way (to win a judo bout)’. We’re already eating gyoza tacos and onigiri burgers while dreaming of establishing a Japanese style of football – cultural evolution clearly brings net positives.